How Does Fiber Optic Outdoor Lighting Work? The two things that make fiber optic outdoor lighting unique are that it can be used just about anywhere you wish and it give you some trully unique lighting effects you can create using it. Although it seems like a new technology it's actually been around for over 20 years now. Fiber optic lighting is the method by which light moves about a cluster of glass fibers. Similar to how electricity travels in electrical wires through a cluster of copper fibers. The fiber optic cables are made up of individual strands of glass streached into long, thin fibers. So thin that you can actually bend them without the glass shattering. The glass fibers are then clustered together and bound into a rubber casing to hold the fiber clusters together.The source of the light begins at the base. The base is an electrical light fixture designed to work with fiber optic lights. Your light source emits its light into the fiber optic wire which in turn allows the light to pass seamlessly through to the other end of the wire. The reason why this method of lighting is so unique is because light travels much faster than electricity, therefore fiber optics are able to transmit a lot of light very quickly through light transfer. Outdoor fiber optic lighting is primarily used for decorative purposes. Once spliced, the opposite end of the fiber optic wires reveals a magical array of vibrantly colored and individually luminous glass fibers. 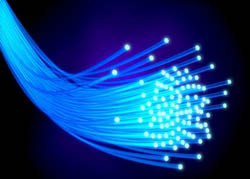 A huge advantage of fiber optic lighting is that the fiber optic cables don't use electricity. This makes them ideal for the volatile temperature changes and outdoor environments that mother nature blesses us with. They also don't need a fixture in order to produce the light output they were meant to produce because the tip of each glass fiber when cut glows with the light produced from the base. Because electricity is not running through these optical fibers, you don't have to worry about someone getting injured. Its very important to keep the base in a dry place with pleanty of ventilation because it does get pretty hot. The main disadvantage of fiber optic lighting is that its primarily used for decorative purposes. Fiber optic lighting is a great way to create really cool effects but its not designed to be your only source of outdoor lighting. You will probably need another main source of lighting to supplement its weakness. Another disadvantage is that Installing fiber optic outdoor lighting should be performed by a professional. In order to create that stellar effect, your fiber optic lights need to be built into your structure, be it a wall, a stairway, a pool or a patio. Before installing outdoor lighting make the decision to hire an experienced outdoor lighting designer. For this particular project you want to make sure your lighting designer has ample experience to perform his job, but also make sure that you feel comfortable with the contractor he works with. Fiber optic lighting comes in two forms. End emiting is used decoratively to create a stellar effect since the optical glass fibers that run through a black sheeth allow light only to be seen at the end of each glass lense. Side emiting fiber optic lighting is when the fibers are bundled together in a clear sleeve so that light can be seen through the clear sleeve all accross the length of the wire. Fiber optic lighting isn't often used as a primary source of outdoor lighting but is an excellent way to create a main focal point for a decorative outdoor lighting project. Use fiber optic outdoor lighting for any water features. The glass fibers do not contain electricity, eliminating the potential harm electrical wires could cause when exposed to water. Use end emitting fiber optics in your pool or fountain to create a consellation surface where the optical fibers are embeded within the surface of the pool or staircase. When lit, the embeded fiber optics look like a consellation of twinkling stars in your pool. Use the same idea on your patio, staircase, or wall and you will impress everyone. Fiber optic outdoor lighting can easily be modified to give off whatever color you wish. Simply change the color filter on the base of the unit. The base if you remember produces the light output. Be as creative as you wish and change the filter as often as you'd like. You can really add some cool features to your fiber optic lighting. Invest in a motorized filter changer and your base unit will change color filters automatically for you. All you need to do is sit back and enjoy the colorful light show. Fiber optic outdoor lighting is trully magical. It's vibrant look will literally transform your outdoor environment making you the talk of the town.